Join T.G.I. Friday's E-Club today and you will entitled for T.G.I. 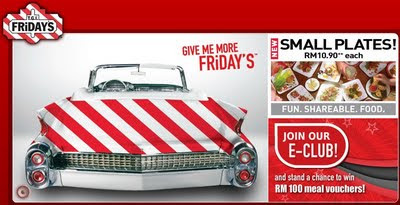 Friday's monthly lucky draw to win RM 100 meal vouchers! It's very simple. You just need to send your details HERE OR fill up T.G.I. Friday's E-Club card at TGI Friday's Pavilion, TGI Friday's Queensbay or TGI Friday's Hartamas, and you will get a chance to win T.G.I. Friday's meal vouchers.